Rendering of the new hotel. For all the success that has come to Magnolia Avenue in the Near Southside over the last decade, it’s a bit surprising to step back and realize that there’s been little in the way of new construction along the street. 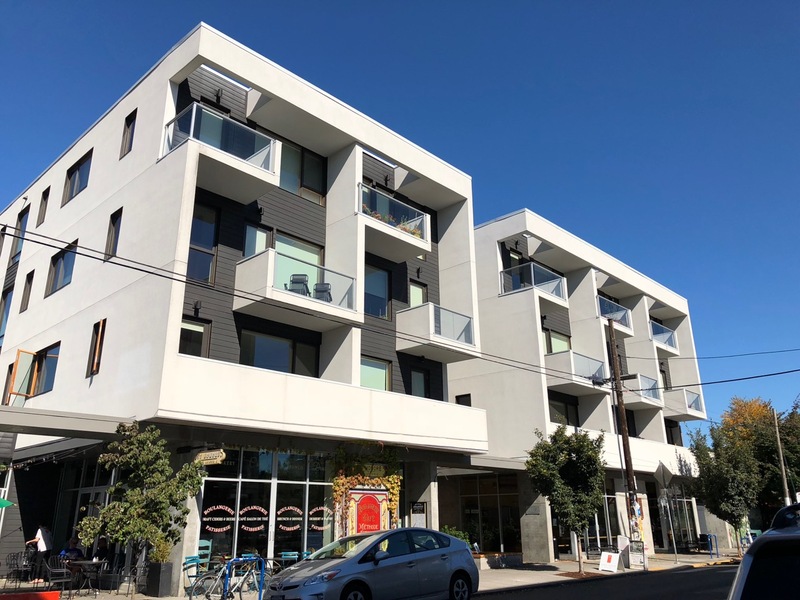 Virtually everything that has opened along Magnolia has been housed in existing buildings, most of which are early 20th-century commercial structures that have been renovated but kept their classic appearance. 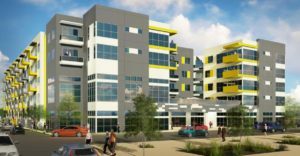 There are still a smattering of vacant lots and some less-than-attractive commercial buildings that went up after World War II, but apart from a large medical facility east of Hemphill, not much new has been created. 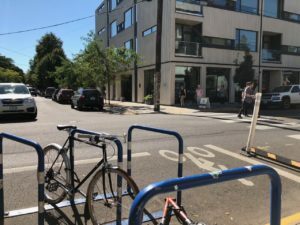 That’s starting to change, and somewhat unexpectedly for a street whose fortunes have mirrored those of the adjacent Fairmount National Historic District. 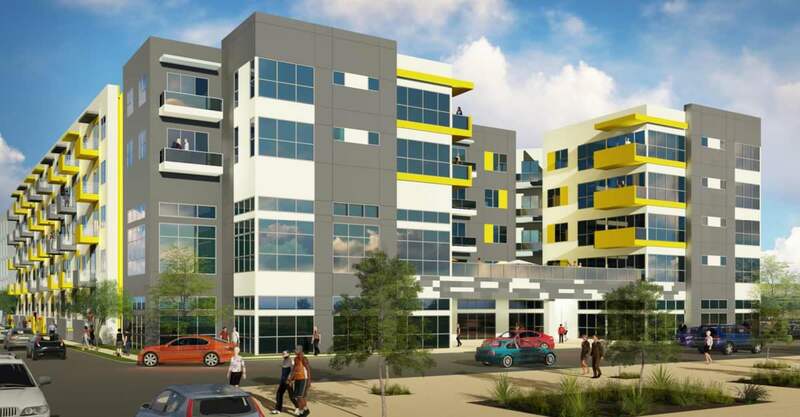 Much of the new development happening on Magnolia is taking a decidedly contemporary approach. 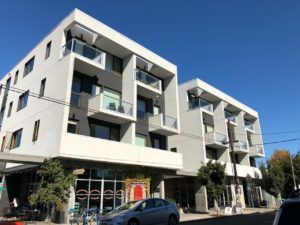 A number of new buildings are breaking from the pre-war architecture of the historic district and providing a forward-thinking context to their existing neighbors. 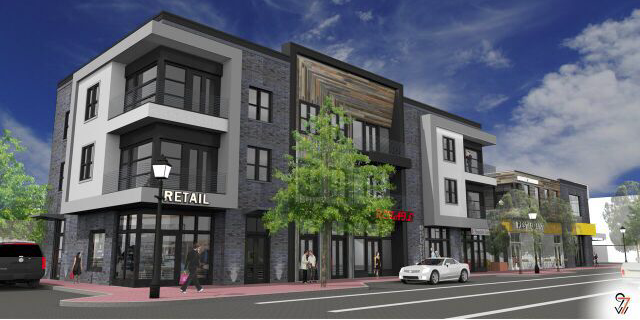 Already under construction, the mixed-use building at 1455 West Magnolia (across from neighborhood mainstay Benito’s Mexican Cuisine) will bring six residential units and ground-floor commercial space housed in two-and-three-story structures of gray brick, light gray stucco, and earthy wood arranged in an angular update of the kind of classic mixed-use layout common along streets like Magnolia. 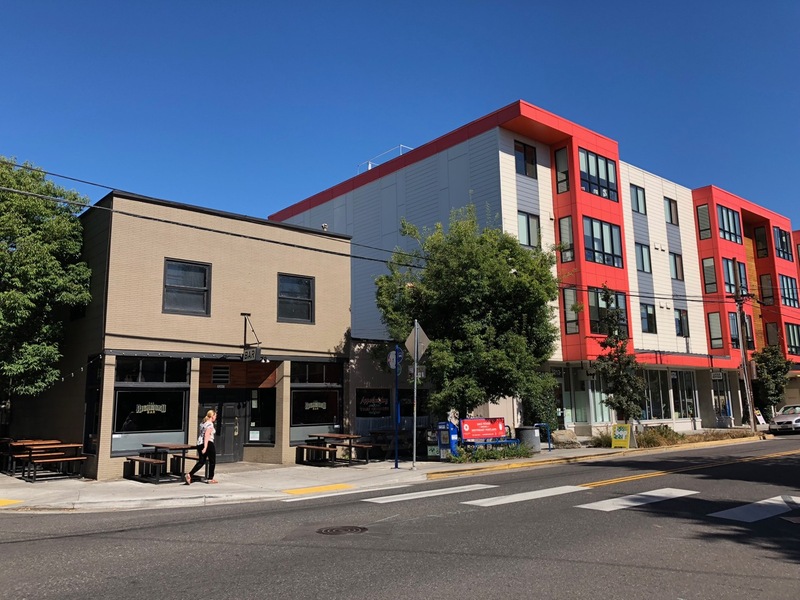 The buildings will add height and density while still being of compatible scale with their surroundings, and they look to push the design language of the street forward while not being wildly out of step with the simple, blocky older commercial buildings nearby. We already know who some ground-floor tenants are going to be: a location of Fort Worth favorite Salsa Limon and a new record store called Panther City Vinyl. 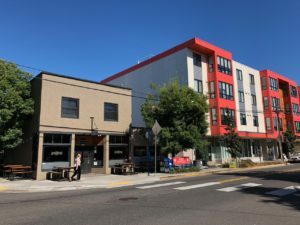 Further to the east at the Henderson Street intersection that already serves as Magnolia’s tallest, most built-up set of blocks, a new hotel will be built across Henderson from the historic Max Mehl Building. 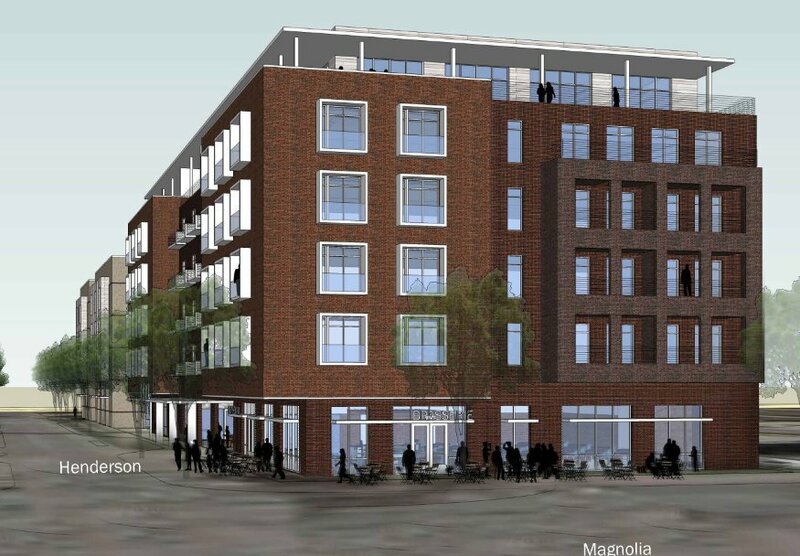 The hotel was a bit contentious during the planning due to its size, which always seemed unwarranted to me –– it’s of similar scale and form to the existing historic Magnolia Centre building across the street, and from renderings feels like it will not be incompatible with its surroundings. The hotel is a right-angled red brick building with white box balconies, and its design and color scheme are playing off the Max Mehl building across the street, in an interesting design conversation between the 1920s and 2017. It is this context –– design lineages from one neighboring building, height from another –– that makes the new hotel feel like an engaging addition to the street. Further east across Hemphill Street and removed from direct interaction with the Fairmount neighborhood, a boldly-colored new mixed-use development at the intersection of Magnolia and May Street adds a splash of energy and, along with the new Moncrief Cancer Center across the street, establishes the eastern end of Magnolia as a place of new, higher density. The development adds 238 new apartments as well as ground-floor retail space along Magnolia. The building is of an unusual-for-the-area color scheme, with its white and gray blocks interrupted by squares and streaks of bright yellow, all forming a kind of geometric Lego-like pattern. These new arrivals of contemporary design to a street that has been defined by a more historic character over the course of its renaissance thus far may take some adjustment for fans of Magnolia Avenue, but I feel like they can enhance the street –– not only from the perspective of adding new residential and commercial activity, but also via adding a modern context for the street’s historic structures. 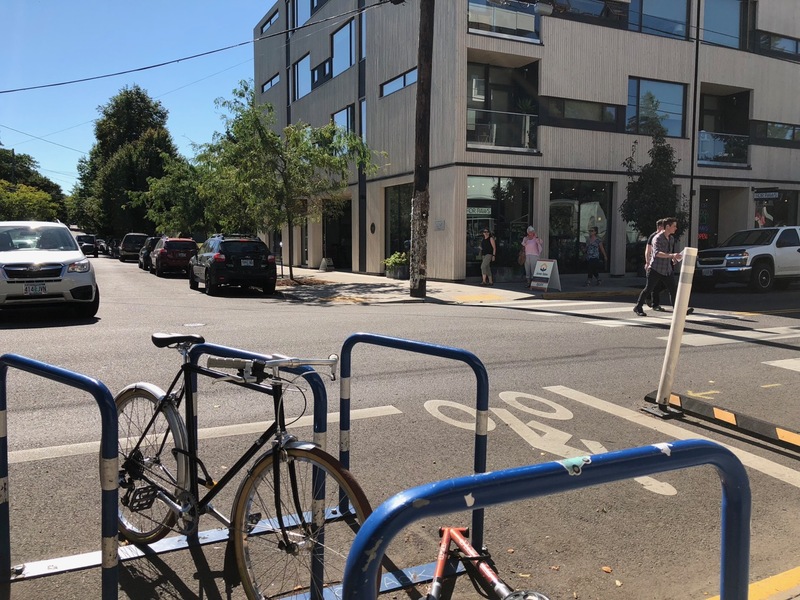 As Magnolia starts to see more new construction of this sort, the street will take on an eclectic architectural feel and we’ll be able to see a wide variety of smaller-scaled urban buildings within a short walk or bike ride. I recently spent a week staying at a historic house on Division Street in southeast Portland, Oregon. Division reminds me a lot of what Magnolia could be like in another 10 years. 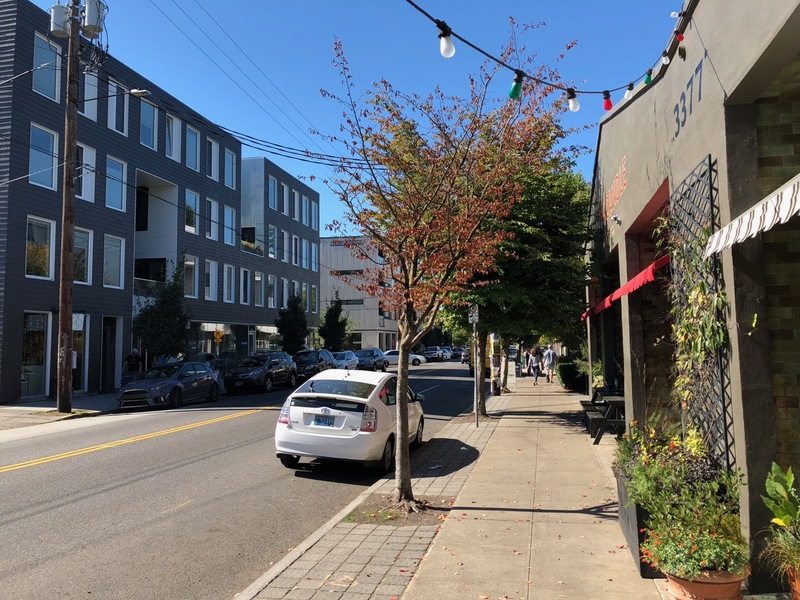 It’s a narrow, human-scaled neighborhood main artery that’s lined with a variety of classic pre-war and contemporary architecture and immediately adjacent to dense neighborhoods of pre-war bungalows, and it’s become one of Portland’s busiest and most successful urban neighborhoods. 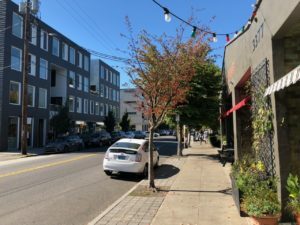 Places like Division Street show how contemporary infill development can live alongside historic pre-war neighborhood fabric and enhance the street, and it’s not hard to see how Magnolia Avenue will likely follow a similar path in the years ahead. 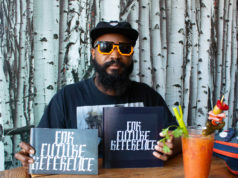 Really enjoy your observations about the changing local landscape. Thanks, Kevin! Looking forward to future insights.